Information at the speed of thought. The Silicon Graphics collection features only a few items, though we do plan on expanding this area with more additions in the future. The collection currently includes an Iris Indigo and a stack of Indy workstations. The SGI Indy workstations have been actively used by another member of Higher Intellect, but prior to use we had to run a password crack utility to brute force the root password as the units had been purchased untested at an auction. 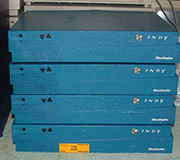 This section includes four SGI Indy workstations we purchased at an auction. One of them is a non-functioning parts backup. Indy configuration features a 133Mhz MIPS CPU, 160MB RAM and a 2GB hard disk. As of 2018 we've been restoring two of the Indys for light to moderate use. Our primary Indy features the R5000 180MHz CPU, 256MB RAM, 16GB storage via SCSI2SD kit, 24-bit graphics and IRIX 6.5.22. Our secondary Indy features the R4400SC 200MHz CPU, 64MB RAM and will have IRIX 5.3 on an older SCSI disk. 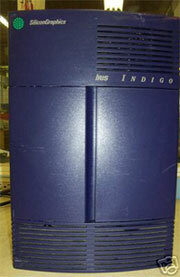 The Iris collection currently features an Iris Indigo workstation with the R3000A CPU running at 33Mhz. The workstation also has 32MB RAM, but no internal hard disk as this was not included when the unit was purchased. November 2013 - Some changes to the archive are being made as we are locating and expanding any compressed files which contain documents or other content. This will allow for easier access to them as they will be indexed by search engines. We have also added a Bitcoin donation link for anyone wishing to assist the project. March 2013 - We are actively working to improve our content delivery, and have since deployed a total of four global mirrors to provide more than enough available bandwidth. Work is also being done to add items to the archive and allow search engines to index the collection faster.